Kate Bottley is in the Yorkshire Dales for lambing season, and the archbishop of York meets the mother who forgave those responsible for the death of her son. 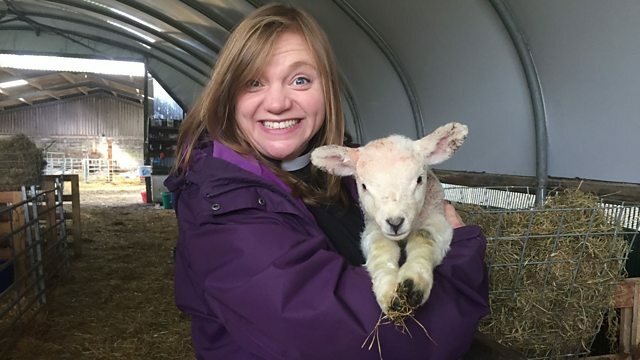 The Reverend Kate Bottley is in the Yorkshire Dales for lambing season, and the archbishop of York meets the mother who forgave those responsible for the death of her son. There Is A Green Hill Far Away from St Albans Cathedral, St. Albans. The Rev. Kate Bottley visits Haw Pike Farm during lambing season where up to 1000 lambs are expected. She joins farmer Andy as he checks on the flock, to gain an insight into his work and to hear how his faith sustains him during this busy time. Kate witnesses the safe delivery of a newborn lamb, and helps to choose a lamb for the blessing of the lambs ceremony. In a special three-part mini-series The Archbishop of York, Dr. John Sentamu, meets three remarkable women whose faith is at the core of their lives. Gee Walker was thrust into the public eye 11 years ago after her 18-year-old son Anthony was murdered. She spoke in public of how her Christian faith compelled her to forgive her son's killers. She founded the Anthony Walker Foundation in his memory, a charity which campaigns against race hate crime through education, sports and the arts. Josie d'Arby heads to Halifax and meets the pupils of St. Malachy's Catholic Primary School who are celebrating Lent rather differently this year. They are taking on 40 challenges for the 40 days of Lent to encourage creativity amongst the children as well as to raise funds for charities and integrate with the local community. The Rev. Kate Bottley visits the beautiful Bolton Abbey Estate. She finds out how the canons of the now-ruined priory made a living from sheep farming. And she joins the community in the Priory Church as they come together to thank God for lambing season. Kate lends a hand as farmer Andy provides sheep and lambs for the blessing service.